AOL dropped a bombshell on the online media world late Sunday night with the news that it is acquiring popular blog network The Huffington Post for $315 million and will make founder Arianna Huffington its head of all things content related. Om is skeptical about the potential for the success of this merger, and I’ve written about my thoughts on the deal as well (I think it’s a pretty good arrangement for both, although its long-term success remains a question mark). Here’s a roundup of some of the other commentary on the announcement from the web and from Twitter. I’m hoping that Huffington will recognize how this looks and then do the right thing: namely, cut a bunch of checks to a bunch of the most productive contributors on whose work she’s built a significant part of her new fortune. They’ve earned some of the spoils. Making content for search is not, I believe, a growth strategy, as the more Google becomes personalized and successfully seeks out signals of quality and originality, the more SEO will die as a black art. 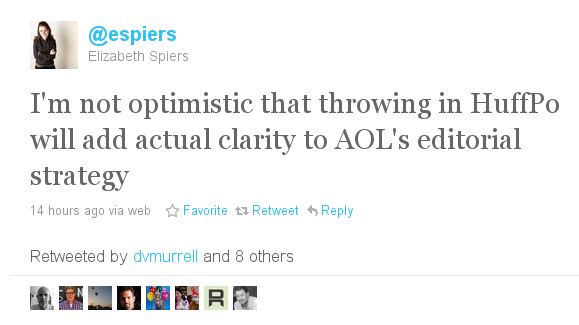 So to execute on its content-and-advertising strategy, Aol needs brands with engagement. Huffington Post is that. David Carr, the media writer for the New York Times, says that the deal is in some ways a flashback to the merger between AOL and Time Warner, which was about marrying the content of Time Warner with the online and digital savvy of AOL. Those synergies never came to pass, he says, but the combination of The Huffington Post and the former online portal is essentially a bet on the same phenomenon. In a sense, the sale is a vindication of Mr. Lerer, who ended up on the sidelines after arriving with AOL in the wake of the Time Warner merger. He and others who were with AOL have maintained that the value of content in a new media world was vastly underrated and now he has a big fat payday to show for it, from his former employers, no less. The game clock was ticking down on C.E.O. Tim Armstrong’s pledge to demonstrate by the second half of this year that AOL could mount a comeback from the near dead. AOL suffered a dismal last quarter of 2010, with revenues and traffic and subscribers continuing to fall. Quarterback Armstrong was not scoring with pledges to transform AOL into a content company. When Armstrong claims, as he did, that the synergies to be achieved by combining the two companies was the equivalent of one plus one equals twelve, I’m reminded of when AOL and Time Warner made similar claims for their 2000 merger. Beware. But by placing AOL’s content efforts under the Huffington Post umbrella, Armstrong demonstrates that he understands that AOL can’t win by gaining a few yards at a time. I’m disappointed in the Huffington Post. I thought Arianna Huffington and Kenny Lerer were reinventing news, rather than simply flipping to a flailing conglomerate. AOL has gathered so many of our rivals — Huffington Post, Engadget, Techcrunch — in one place. The question: Is this a fearsome Internet conglomerate or simply a roach motel for once lively websites? Emily Bell, former head of digital at The Guardian and now director of the Tow Center for Digital Media at the Columbia school of journalism, said in a piece for The Guardian that Huffington Post’s success “is driven by its position outside the establishment” and that as a result “AOL’s attempt to co-opt its culture could backfire.” MarketWatch founder Larry Kramer says that AOL may have lots of content, but it doesn’t have an editorial “soul” or personality, something The Huffington Post does have. But he’s not sure the merger will be able to transplant that to AOL. AOL has spent mightily to build its content business, from Finance Daily to Patch, the series of hundreds of local news sites it is building. But it has done so without doing something essential to the success of any media business. It hasn’t build an editorial soul, or identity. I really liked Huffington’s coverage – hopefully things don’t chance now that Yahoo owns them. It’s good that Arianna Huffington will still be running things. Who can say no to 300 million? 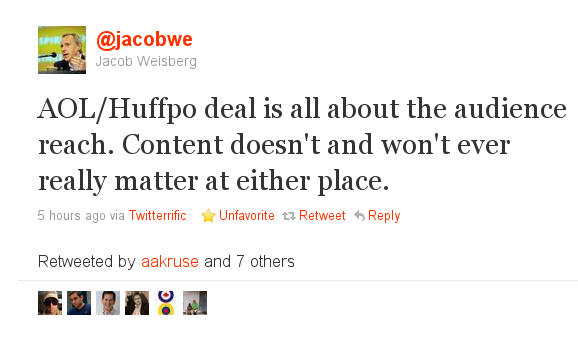 It’s a good deal for Huffington, but it’s irrelevant for AOL. Or it would be irrelevant if they were paying for it in stock, but instead they are burning up $300M in cash, which they will need at some point soon. This deal, and AOL in general, demonstrates why companies like Facebook and Twitter are over-valued. They all depend on general web ads, of which there are a seemingly infinite supply. The barrier to entry for creating a website is near zero, and just about any website can sell ads. Now Google and Microsoft (with Bing) at least have an advantage, as search engines provide a perfect audience for advertisers – people who are looking for specific information that they can match their ads with, not just people who happen to stumble on a website with ads on it. TV and newspapers have finite spaces for placing ads, and if you want to reach viewers of a specific show, you will compete with other advertisers, which drives the price up. If you are just looking for eyeballs on the web, and don’t care about the demographics of the page viewer, the price for advertising will drop as low as the cost of operating websites will allow. Which, when combined not only with the general growth of the web, but also with the flood of new ad-financed websites that are launching every day, will be very low. Low enough that profits will never meet expectations for most websites. The 90s dotcom crash happened because people believed a business model for running websites would eventually appear, but it didn’t materialize in time for many of them. 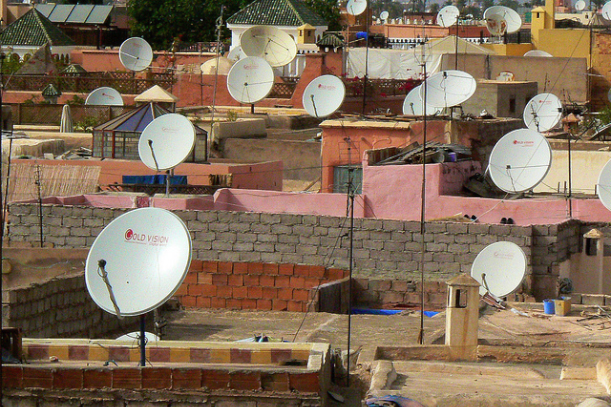 A business model did eventually show up, but the more companies deploy it, the less it is worth. AOL can generate revenue from all of the content it owns, but whether there will be enough profit left over to justify the valuation they want is another story (most likely a sob story).